You can’t come to Chiang Mai and stay on a diet; Thai food is world-famous and Chiang Mai is the restaurant capital of Northern Thailand. Whether you grab a tasty local dish for $1 from Chiang Mai Gate Market or savour Lobster Thermidor for $85 at the ritzy David’s Kitchen, Chiang Mai’s variety of top-notch cuisine is seemingly endless. Some mornings Alan and I will have breakfast at my favourite local soup shop, where I pay $1.50 for Gao Lao Moo Krob, a spicy, crispy pork belly soup—delicious and a great way to kickstart the day. We then take a stroll to Jang Kub Coffee where every cup served is a rich and frothy work of art…and a bargain at $2.50. If I fancy picking up a takeaway, I head to my local market for my favourite spicy noodle dish, Khao Soi…which sets me back about 75 cents…but you can dine out well here for as little as $4.50 a head. A large local beer will cost you around $2.30 and cocktails start at $3. Chiang Mai has many famous festivals throughout the year but my favourites are Loi Krathong and Yi Peng Festival, held in November. Loi Krathong begins with a colourful parade of floats, music and dancing. Locals make and sell krathongs, banana leaf baskets, beautifully decorated with intricately woven banana leaves, flowers, incense and candles. In the evening, you take your krathong to the River Ping, where you make a wish, light your offering and set it afloat. It’s a spectacular sight to see thousands of flickering lights reflected on the water as they slowly drift downstream. Loi Krathong coincides with Yi Peng, popularly known as the Lantern Festival. After buying a lantern for less than $1 from one of the many markets or pop-up stalls, people flock to Chiang Mai’s bridges to launch them. The lanterns slowly rise to join the thousands of others lighting up the night sky as they make their way to the heavens. One of my favourite things to do in Chiang Mai is to walk the streets of the Old City exploring the many wats (temples). Quiet and richly-decorated with gold, silver and tiny, multi-coloured mirrors, the Old City’s Buddhist temples are a haven of peace. I love listening to the temple bells and watching the monks, resplendent in dazzling orange robes, as they go about daily life. For me, the most impressive temple is Wat Phra That Doi Suthep. 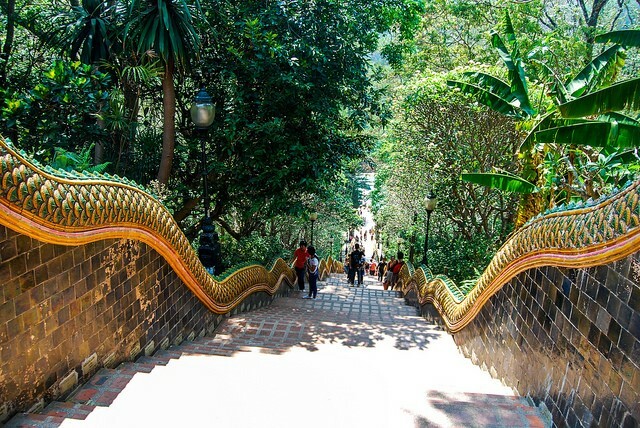 Walk up the serpent staircase to this beautiful temple complex which includes a tall golden stupa that gleams in the afternoon sun. With stunning views overlooking Chiang Mai, Doi Suthep is a must-see for anyone spending time in Chiang Mai. If you love music, Chiang Mai is the place for you. It’s great to get together with friends to go out and discover Chiang Mai’s musical talent. You’ll be spoiled for choice with venues offering free entertainment showcasing some of Thailand’s most talented musicians. Take in rock classics with The Black Hawks at Anusarn Market, listen to the blues at Boy Blues Bar at the Night Bazaar or watch bands play at North Gate Jazz Co-op near the Chang Puak Gate of the Old City. Play your cards right and you might even get to jam with the band. If, like me, you adore markets, you’re in for a real treat in Chiang Mai. Just north of the Old City you will find my two favourites: Muang Mai Market and Warorot Market. Watch out for motorbikes and trollies as you walk through the bustling lanes of Muang Mai Market. Get there early, the morning is the best time to go and it’s when the fruit and vegies are freshest. The variety of produce will astound you…as will the prices…a large bag of tomatoes will cost you 80 cents and a large bag of sweet mangoes can be had for just $2. Warorot Market is the place to go for kitchen wares, jewellery, clothing, shoes, fabric and traditional costumes. I never get tired of exploring this market, if you find you need something while living in Chiang Mai, chances are you will find it at Warorot Market.